Are you looking for a company-wide assessment that provides a broader range of insights than the typical “company culture” instrument? Would it be helpful if this same assessment also tracked improvement and measured ROI? The new Performance Gap Indicator (PGI) empowers trainers with an assessment that evaluates FIVE company-wide performance areas, plus separate reporting for initial analysis and subsequent followup analysis, so you can objectively track progress and demonstrate real ROI. Culture – The written and unwritten set of values, beliefs and behaviors which determine how your company’s employees interact with one another, with customers, and with vendors. Training – The process of providing leaders and teams the tools, time and guidance to master their responsibilities based upon your company’s stated performance standards. Leadership – The direction, clarity, and accountability which inspires and empowers others to reach the vision. Service – The ability to consistently exceed customer expectations which generates repeat and referral business by providing exceptional service. Operations – The process, systems and procedures required to consistently conduct your business a the highest level of efficiency and effectiveness. Business leaders can easily misreport the source of their organization’s challenges. The sales team may be underperforming, but is it due to a lack of adequate training or operations? Employee retention is slipping, but is that really stemming from culture or leadership? Before PGI, consultants were forced to rely on manual discovery processes to uncover these answers. Done correctly, this has always been time consuming, expensive and prone to human error. A perfect first-step for any consultant’s early discovery process, the PGI assessment reveals an organization’s area(s) of need based on an anonymous, mobile-friendly survey. Deliver the PGI assessment to every employee, from your Assessments 24×7 dashboard, in only seconds. PGI helps consultants get their foot-in-the-door and empowers in-house corporate trainers with facts instead of finger pointing. PGI is the most robust company wide assessment of it’s kind, functioning like a “MRI” for your organizational health. Pinpoint company wide struggles faster – and with improved insights – so subsequent coaching and training investments are administered with the kind of laser-guided accuracy that provides demonstrable results. 1. 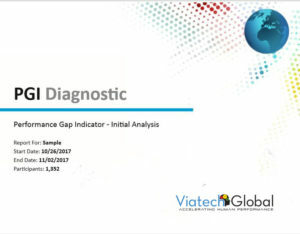 [Initial Analysis] Administer the PGI Diagnostic to an entire company (or department) for a complete report on the organization’s current status across the five key performance areas: Culture, Operations, Leadership, Training, and Service. 2. [Action Steps] Recommend and launch individual coaching and/or group training initiatives that address the performance gaps identified by the PGI Diagnostic report. These initiatives enable consultants and trainers to offer laser-targeted solutions leveraging individual assessments (DISC, Motivators, EIQ-2, etc. ), team reports, benchmarking and other instruments. 3. [Followup Analysis] Additionally, you can administer the PGI Pulse after completing individual coaching and/or group training initiatives (ex. 6-months, 12-months). Continually administer the PGI Pulse report to track ongoing company-wide progress during extended consultative relationships. Consultants can also administer the PGI Pulse at conclusion, to provide their client organizations with demonstrable ROI.